Work continues apace on Swindon Railway Station's forecourt. With blazing sunshine and a 17 degree temperature everyone was in a great mood, plus it was a Friday, so that helped! The retaining wall by the new drop-off point. Today's visit saw the retaining wall by the new drop-off point (located just along Station Road) nearing completion with the concrete now covered in tiling. 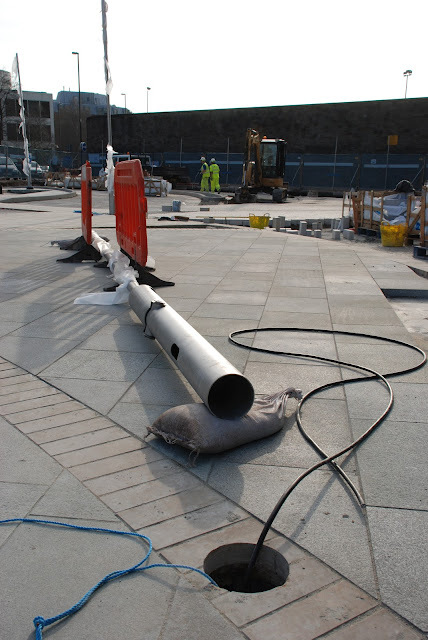 The paved area leading from the station entrance doors, across the forecourt, over Station Road and towards Wellington Street. 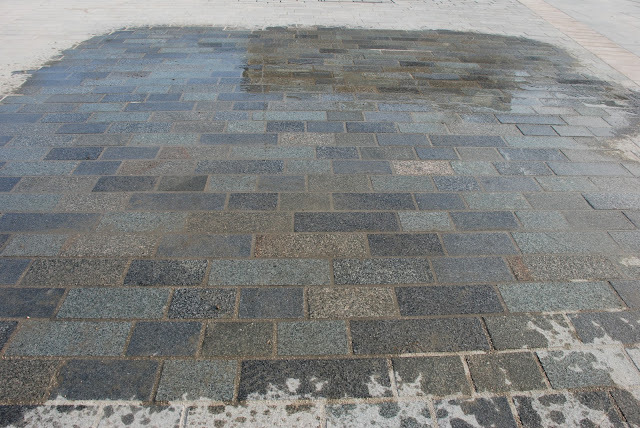 Four different shades of paving have been used and a splash of water shows the varying tones. Big areas of concrete continue to vanish under all the different shapes, sizes, colours and textures of paving. 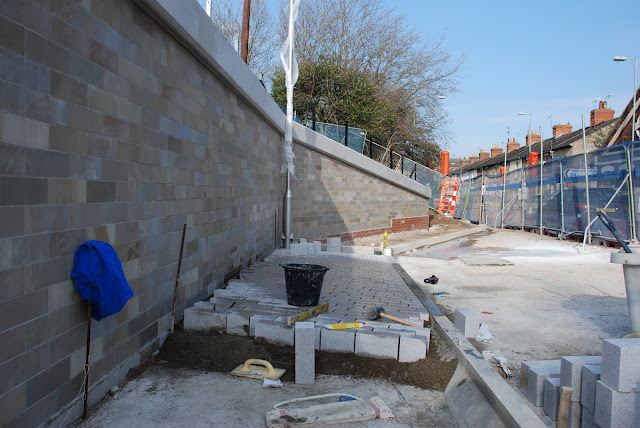 Dan washed down a section of the main walkway that will lead across Station Road. Instantly, with the dust washed off, you could make out the four shades of paving used in this one section. At the moment, the entire site is covered in a layer of fine white dust, a wash will give the whole space a dramatically different look (especially to the Britannia team and regular visitors). A new light column ready to be installed. The new light columns are in the process of being installed, making an interesting contrast with the originals (which are still in original Great Western Trains green and ivory from 1996!). From the roof, the reality starts to really resemble the plans and drawings. 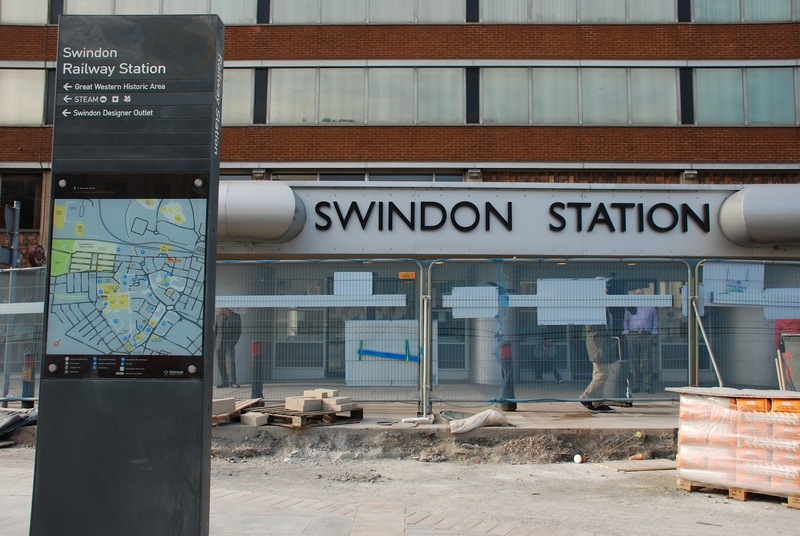 The current view from Swindon Railway Station's Signal Point building. In the next week or so, the central area will be opened to the public, whilst work shifts to the areas that are currently open. 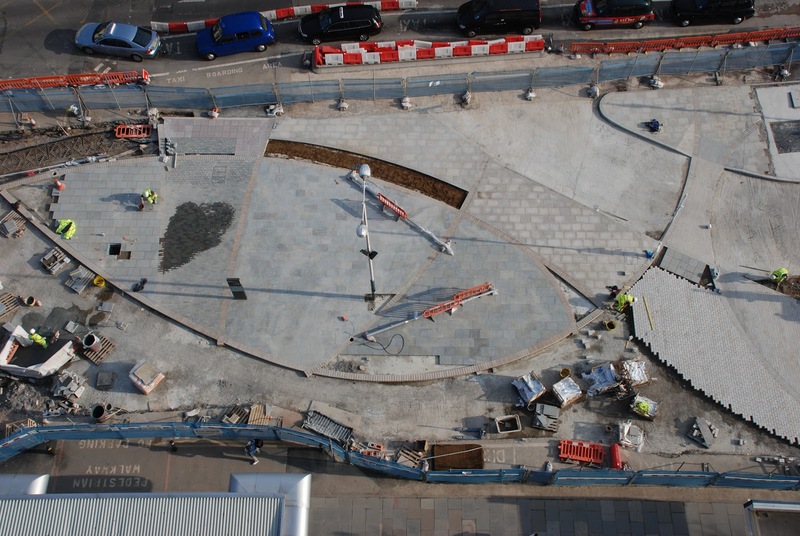 Once they're done, all the pieces will become one new pedestrian forecourt for Swindon.